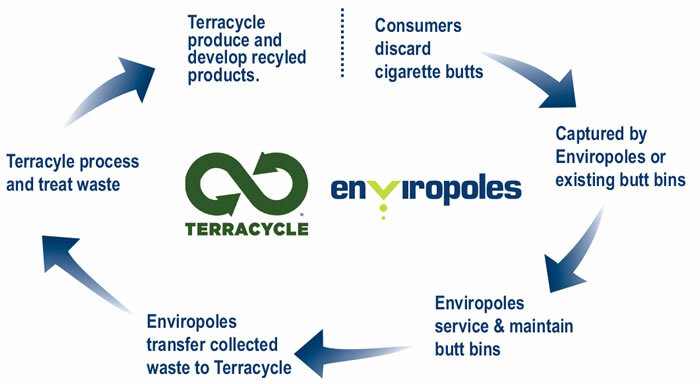 Enviropoles have partnered with the premier US cigarette waste management company TerraCycle, implementing a long-term recycling scheme across Australia. This agreement is a first of its kind in cigarette litter management in Australia, and significantly improves the quality of life for the urban and rural population across the country. Enviropoles sought assistance from TerraCycle for the growing issue of waste management as the US shares the concern of butts littering residential areas and polluting fragile ecosystems. Out of the 300 billion cigarettes sold in the US annually, it is estimated that one third are disposed of incorrectly; that figure is proportional to the percentage of discarded butts in Australia; one in three. To combat this issue, the environmental experts at TerraCycle have delivered their sophisticated recycling system to Australia to repurpose butts - transforming the waste in to entirely new products including park benches, fashion items, household utensils, office equipment, toys, gardening tools and building materials. Through this initiative, Enviropoles and TerraCycle are planning to not only cease a sizeable portion of the 7 million butts disgraced across Australia annually, but to change the way Australians think about recycling. Terracyle was founded in 2001 by Tom Szaky, then a 20-year-old Princeton University freshman, who began producing organic fertilizer by packaging liquefied worm waste in to used soda bottles. Since then, Terracyle has become one of the fast-growing green companies in the world, dealing with more than 100 major brands in the U.S. and 22 countries overseas.